First I tried it with equal amounts of the liquors, but then the Kalhua is slightly overpowering. The second one had less Kalhua but more taste. 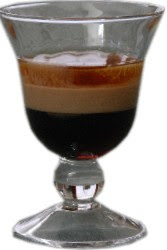 This drink is a mellower version of the ever popular B-52 (why don't I have an entry for it yet?). As to the Cognac, I have used Hennessy, but I believe any would do.